A home is basically a place where you grow up in. In an ideal home, the presence of a family and a sense of belongingness is there. Home is also close to one of the most important figures in our lives in the early stages of development, childhood friends.You may also see room rental agreement templates. Friends make you feel accepted in this world because you are a part of a group and you have someone to talk to when none of your family members are around or are all busy. But the beauty of life is that you also make friends after your childhood. Future friends can mostly be met in school and, sometimes, in an apartment as your roommate/s. You may also see agreement samples. We will also provide templates that would let you better visualize this kind of agreement since the parts of this agreement may vary from other apartments. 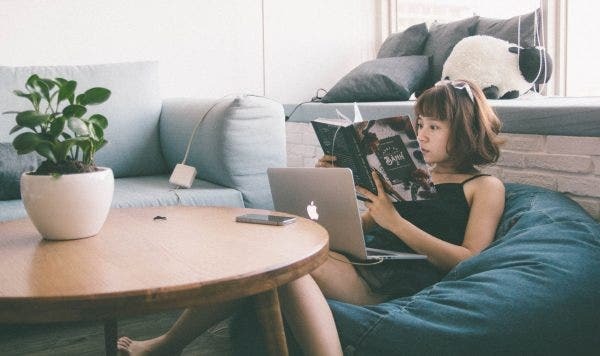 Lastly, we will finish this article by providing you some of the advantages of having a roommate in an apartment or dormitory. Having a roommate can lessen your overall rent. In this article, we will talk about an agreement first that will take place for the purpose of a substantial environment in the apartment room for you and your roommate. This is called a room rental agreement. 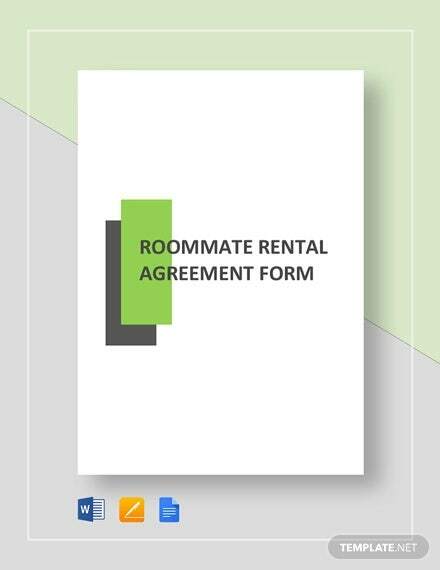 Before we discuss the parts of the roommate rental agreement, let us first tackle what it means to rent something. Renting is sometimes understood as borrowing while you pay for the things you borrow. In this case, you are borrowing a room from a landlord. The landlord services you with a room. Things such as the bed, floor, table, TV are already part of the things you are renting in the room. One gets an apartment because of many reasons. Those reasons can be because it is closer to school. This is relatable who live so far away from their perspective university and is often in college. For some, people live in apartments if it is closer to the place that they are working and trying to make a living to save up for a better house in the future for him or for his future family. In order to have a cheaper stay, it is best for one to go for an apartment that allows you to have roommates to make the price cheaper because you will be dividing it with your roommates. 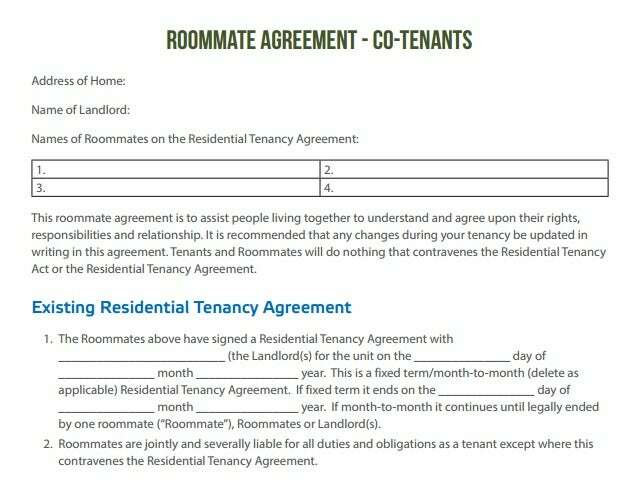 You may also see roommate agreement templates. Introduction. This is the first part of the agreement which it will state to who this agreement is between for. Additional information should be the address and when the agreement was officially signed by everybody involved. 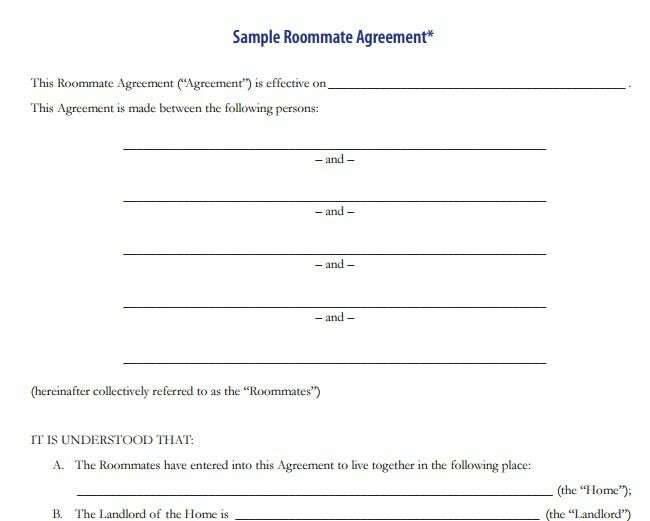 You may also see roommate agreement templates. Name of the Roommate. This is where each roommate will affix their respective names. Lease Term. In this section of the agreement, this will state when will the agreement begin and when will it not be effective anymore or simply the end of residency if one would not wish to extend his or her stay. 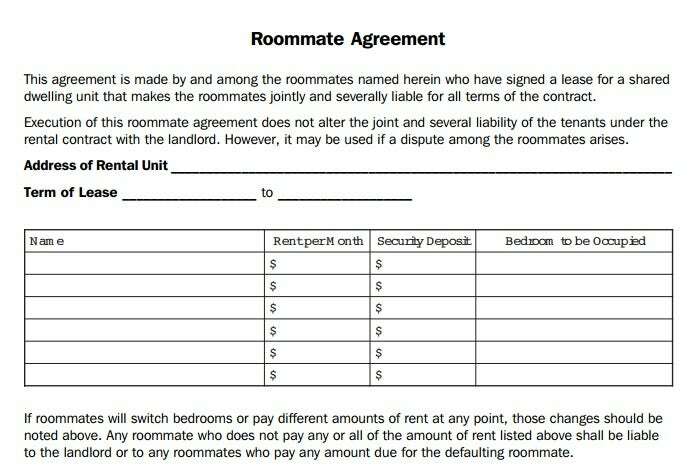 You may also see roommate agreement templates. Rent. In this section, the rent per month should be stated. It will state the week and date of the month the rent must be paid to the owner or landowner. 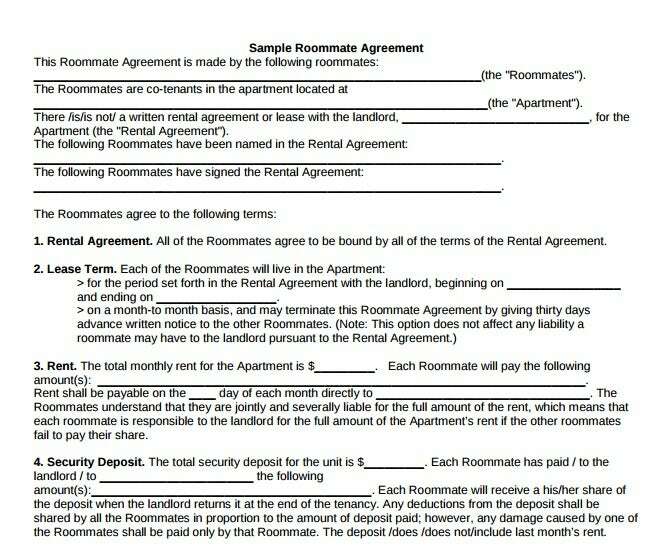 In some circumstances, if the roommates fail to pay the rent, the one who paid has to pay again for him if it applies to the agreement of two people. You may also see standard lease agreement templates. House Rules. This might be according to the landlord or from the two people living in the room if the landlord is that flexible and open-minded. Rules like the ban on liquor and amount of noise can be included here. You may also see rental agreement forms. Overnight stay. Roommates have the option to ask or not ask permission from his or her roommate if one friend or a companion of any of the two comes along and sleeps for the night. The two should agree before signing the agreement if they do not need to ask for permission or must do when this situation arrives. You may also see sample rental agreement form templates. Utility Charges. This is considered as the breakdown of expenses. Household Chores. Each roommate will be assigned to do a specific chore and that has to be discussed and agreed between the roommates themselves. You may also see basic rental agreement templates. Agreement Complete and Ready for Binding. This last section will mention that the agreement has been made having been read all the terms and responsibilities. After which the parties involved will fill up their names with their signature to make the agreement legal. You may also see best lease agreement forms. These are the general terms that are found in the agreement. For further guidance on how to construct the sentences for each term, you can refer to our templates being displayed in this article. Having a roommate can have its privacy issues sometimes but that all can change if you start to get to know him or her. You may also see free rental agreement templates. Having a friend whom you can tell how your day was going can be a sigh of relief. It can be depressing when you have experienced a great day and yet you have no one to share it with at home or in this case, in your apartment. Another advantage of having a roommate is that you can also learn from him or her and listen to his or her experience, thus building up the friendship to another level. You may also see free agreement templates. Having a roommate also helps you lessen the burden of doing the chores alone. A roommate can be your best friend or brother or sister for that matter. Just remember to always be kind and open up things to him that you find uncomfortable but make sure you deliver it in a manner that it’s not condescending or offensive. You may also see sublease agreement templates.